You want to teach your child how to speak and write well, but some of those grammar rules sneak up on even the most seasoned pros. 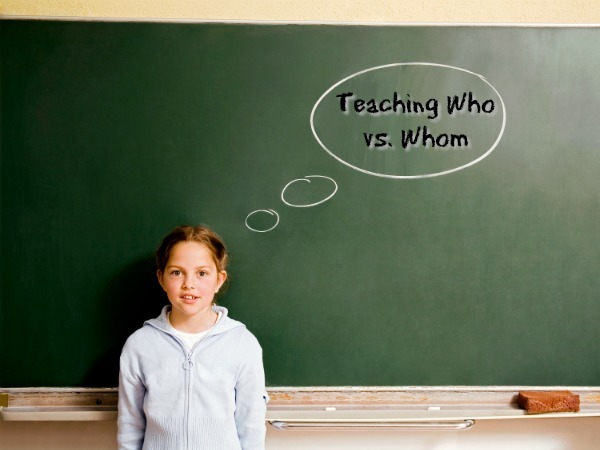 One rule that can cause some confusion is when to use who vs. whom. Here are some simple tips to help your child identify whether to use who or whom when writing sentences. Figure out the part of speech. Who refers to the subject of a sentence. A subject is the person, place, thing, or idea the sentence is about. Whom is the object of the sentence. The object of a sentence is the person, place, thing, or idea receiving the action. For example, in the sentence, “Janie walked her dog to the park,”, Janie would be the “who” (Who walked her dog to the park?) and dog would be the whom (Whom did Janie walk to the park?). Question: Who went to the doctor? Answer: Dad went to the doctor. In this case, dad is the subject of the sentence and answers the question who. Question: Whom did the doctor give treatment? Answer: The doctor gave the treatment to dad. In this case, the doctor is the subject of the sentence, but dad is the object and answers the question whom. Substitute he/she for who or him/her for whom. Try a few simple examples. Question: Who ate the last cookie? Answer: He ate the last cookie. Question: For whom did you bake the cookies? Answer: I baked the cookies for her. Question: To whom do I write the check? Answer: Write the check to her. The question of when to use who v. whom can be a complicatedquestio one, but if you follow these simple tips, you’ll be ready to teach your child about when to use these words in writing. Grab your free worksheet to help master the Who vs. Whom concepts below.